A handcrafted touch adds a bit of personality and customization to a wedding! Even if you aren't getting married until the summer, you can start working on crafts MONTHS ahead of time as you prepare for the big day! One thing every bride needs is a big box for all of those cards (which might contain money or gift cards) that guests bring to your ceremony and/or reception. You don't want to risk someone running off with it either, so what's better than something big and eye-catching? 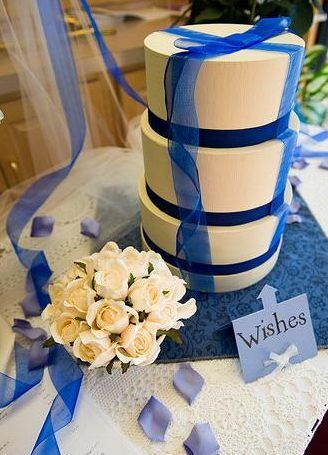 This is a card box shaped like a wedding cake! Stack up your hat boxes and cut big round holes in the tops/bottoms where the boxes connect so the whole thing is hollow. Add a slot on top for the cards to go through. Paint them and glue them together, then decorate with ribbon to make it look more like a tiered cake.